← Your input wanted on Seattle’s Disaster Readiness and Response Plan! Here are a few preparedness-related items to note on your new 2012 calendars! Your feedback wanted! 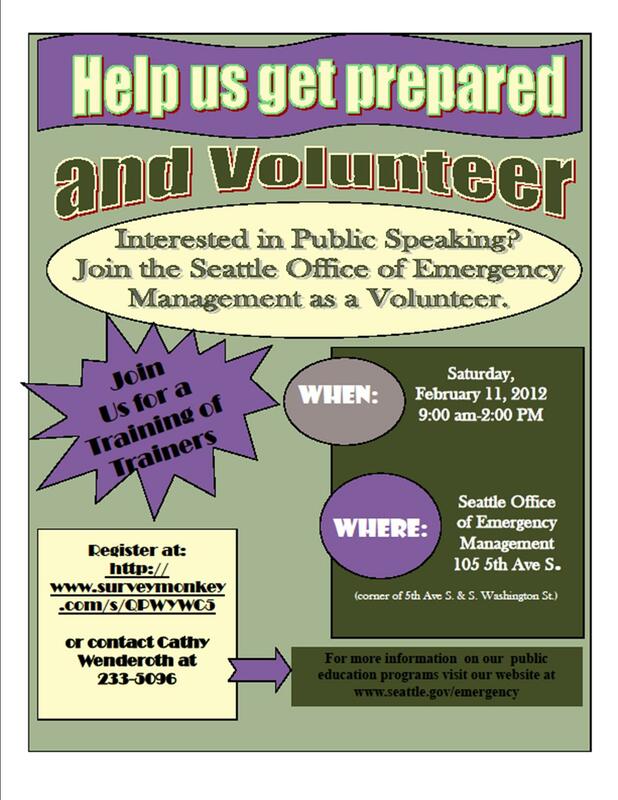 Don’t miss the opportunity to provide feedback on Seattle’s Disaster Readiness and Response Plan. You can do so via a survey or attend an in-person meeting here in West Seattle. Updated, 1/16/12: Due to the snow this week, this meeting that was scheduled for January 17th has been cancelled and will be rescheduled. You’ll find more information in this posting. There are many other emergency preparedness events and activities coming up this year; we’ll post more later. Meanwhile, we hope your new year is off to a great start! This entry was posted in Announcements, Events, Outreach events & festivals and tagged announcements, free classes, Red Cross, Seattle Disaster Readiness and Response Plan, Seattle Office of Emergency Management, training, West Seattle emergency preparedness. Bookmark the permalink.